The Building Blocks are fully functional Audio Effect devices that provide examples of various kinds of operations and processes. You can use these patches in series in your Live Session, or edit and recombine them to make your own devices. Click on the arrow to the left of the folder marked Audio Effects to show the folder's contents. 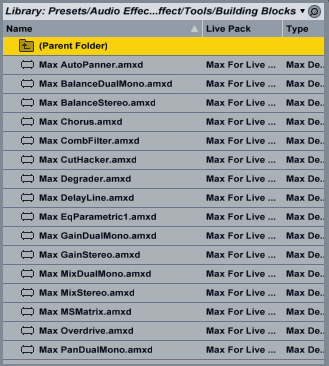 Click on the arrow to the left of the folder marked Max Audio Effect to show the folder's contents. Click on the arrow to the left of the folder marked Building Blocks to show Building Blocks devices. Max MsMatrix : Implementing a popular audio algorithm: a "MS stereo matrix"